Drinking birds, also known as dipping birds, are toy heat engines that mimic the motions of a bird drinking water. 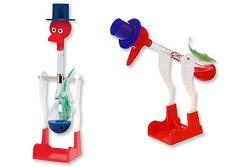 The drinking bird was invented by Miles V. Sullivan in 1945 and patented in 1946, and is not a perpetual motion device. Sullivan was a Ph.D. inventor-scientist at Bell labs in Murray Hill, NJ, USA, and was awarded U.S. Patent 2,402,463 for it. The nifty little glass-and-plastic birds that seemingly bob up and down by themselves contain methylene chloride, a paint stripper with a very low boiling point. When you wet the fuzzy head of the bird, evaporation begins on the outside and cools the temperature of the head, decreasing vapor pressure there. This causes the vapor pressure in the abdomen to send the liquid up toward the head, causing the bird’s head to dip lower and lower. If you place a glass of water under the bird’s head, the head will dunk into the water when it dips down. This slightly warms the head, sending the liquid back to the bird’s belly. This begins the process of evaporation that keeps the drinking bird going on and on for hours of endless party fun. The dippy bird has appeared in TV show The Simpsons, several video games and even the original Alien movie. Rockin’ & Drinkin’ All Night Long. Why does a Glass of Champagne have Smaller and Fewer Bubbles Than a Glass of Beer? Why Does a Beer or a Coke Poured Into a Dry Glass Froth Up Faster Than When Poured Into a Wet Glass? Why do the authorities recommend drinking eight glasses of water a day and how big is a glass?